Professor Mahendhiran Nair is the Chief Executive Officer of Monash Malaysia R&D Sdn Bhd and Vice President (Research & Development) at Monash University Malaysia. He is a Fellow of CPA (Australia) and Fellow of Academy of Sciences Malaysia. He is also a Professor of Econometrics & Business Statistics at Monash University Malaysia. Prior to taking up his current position, he was the Deputy President (Strategy) and Head of School – School of Business at Monash University Malaysia. In his current role as Vice President (Research & Development), he is leading the development of multi-disciplinary research platforms that contribute to the socioeconomic development of Malaysia and regional economies. In his current role as CEO of Monash Malaysia R&D Sdn. Bhd, he has established research collaboration with lead industry associations and industry players to enrich teaching & learning experience of staff and students in the university. The strategic engagement also enhances translational R&D that contributes to nation building. Professor Mahendhiran’s academic training is in the following areas: mathematics, statistics and econometrics. He has many years of experience researching and teaching in Canada and the Asia-Pacific region. He currently leads a research team that uses data science methods to study the impact of Science, Technology and Innovation (STI) on socioeconomic development of emerging economies. He has published his research work in leading international journals and presented in high impact conferences & forums. 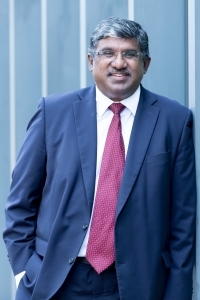 Professor Mahendhiran has been a subject matter expert for government agencies, public policy organisations industry associations and ‘think-tanks’ in Malaysia and the Middle East. Among the key government agencies, he has provided advice include the following: Economic Planning Unit (EPU) – Prime Minister’s Office; National Economic Action Council (NEAC) – Prime Minister’s Office, the Malaysian Indian Blueprint – Prime Minister’s Office, the Ministry of Science Technology & Innovation, Ministry of International Trade & Industry (MITI), Ministry of Education Malaysia and the Asia Pacific Economic Council (APEC) Secretariat. Professor Mahendhiran is an Advisor for the Program Titian Digital, a community-based program that provide 22,000 students from marginalised communities’ access to ICT literacy programs. He also contributes to though leadership in the region by providing regular commentaries on the state of socioeconomic development in both local and international media. My current research interests are in two broad areas and they are outlined below. I am keen to understand how macro policies pertaining to science, technology, innovation impact socioeconomic development of countries. In this context, I have undertaken extensive work on understanding the key enablers of national innovation ecosystems (NIS) in both developed and developing countries and their impact on economic development in these economies. The study also examined how policies and strategies pertaining to the key pillars of the NIS enable countries to leap-frog to higher stages of competitiveness and attain sustainable socioeconomic development. The research work combines endogenous economic growth models with the innovation ecosystem framework. The statistical methods I used to study these complex macroeconomic relationships include dynamic panel data methods; co-integration techniques and statistical pattern recognition methods. Some of my research work have been published in leading journals in the field, including Journal of Post Keynesian Economics, Energy, Review of Financial Economics and Empirical Economics. Some of the research work has been used to assist government agencies in Malaysia and in other developing countries formulate policies and strategies to strengthen their national innovation ecosystems. One of my research interests and focus areas include the study of micro level behavior such as the use of new technology and new financial innovations by firms and marginalized communities to improve the socioeconomic well-being. Some of the key theoretical frameworks used to study these interesting economic include technology adoption, dynamic capability and endogenous economic development models. In most of the work in this area, I use mixed method approaches, which include quantitative approaches (partial least squares method, structural equation models, limited dependent models and statistical pattern recognition techniques) and qualitative approaches (phenomenological, grounded theory and case studies methods). I have undertaken extensive research work on examining key factors that impact ICT adoption among marginalized communities, students and firms. My research team are also studying the impact of firm-level characteristics and other external business environmental factors that impact firm level knowledge intensity and competitiveness. Some of my research work have been published in leading journals in the field, including Studies in Higher Education, Behaviour & Information Technology and Journal of Intellectual Capital. We are also working closely with government agencies, community organisations and industry associations to assess efficacy of the policies and strategies in enhancing technology adoption and improving competitiveness of diverse community in developing countries. Sinnakannu, J., Nair, M., Lee, H.Y, (Editors) (2014) “Islamic business: contemporary issues and economic development”, Lexis-Nexis, Malaysia. Liew, E.J.Y,, Vaithilingam, S and Nair, M. (2014), “Social Network Technology and Socioeconomic Behaviour,”, ICT Strategic Review 2014/2015, PIKOM and MOSTI, Malaysia. Nair, M. and Vaithilingam, S. (2013), “Broadband diffusion, innovative capacity and sustainable development: lesson for Malaysia,” in editor Ramasamy, R., ICT Strategic Review 2013/2014, PIKOM and MOSTI, Malaysia. Nair, M. and Vaithilingam, S. (2012), “Innovative use of ICT among urban-poor communities: challenges and opportunities,” in editor Ramasamy, R., ICT Strategic Review 2012/2013, PIKOM and MOSTI, Malaysia, 181-191. Nair, M. (2011), “Inclusive innovation and sustainable development: leap-frogging strategies to a high income economy,” in editor Ramasamy, R., ICT Strategic Review 2011/2012, PIKOM and MOSTI, Malaysia, Chapter 11, 225-257. Nair, M. (2010), “The e-Commerce Ecology: Leapfrogging Strategies for Malaysia,”, in editor Ramasamy, R., ICT Strategic Review 2010/2011, PIKOM and MOSTI, Malaysia, Chapter 12, 193-211. Nair, M. (2009), “Language proficiency and affinity to the information society: challenges and opportunities for rural society,” in editor Ramasamy, R. ICT Strategic Review 2009/2010: Innovation, the way forward, PIKOM and MOSTI, Malaysia, Chapter 10, pp.141-160. Nair, M., Davison, R. and Kuppusamy, M. (2008), “Competitiveness of ASEAN-5 in the information economy: an empirical analysis,” in Editors Banerjee, I. and Rao, M., Media and Development in Asia: Regional Perspectives, Asian Media Information and Communication Centre (AMIC), Singapore. John, K.J., Nair, M., Selvanathan, P. and Kuppusamy, M. (2005), “Using ICT as a catalyst for sustainable development: the role of national policy,” in Editors Rahim, R.A., Waldburger, D. and Muinde, G.S. Access, Empowerment & Governance: Creating a World of Equal Opportunities with ICT, Global Knowledge Partnership (GKP), Malaysia. Shanmugam, B., and Nair, M. (2004), “The question of ethics within corporate governance’, in Editors, Shanmugam, B, and Nair, M., Corporate Governance: An International Perspective, MICG. Das, M, and Nair, M. (2004), “Corporate Governance in the global soccer industry: externalities and prospects”, in Editors, Shanmugam, B, and Nair, M., Corporate Governance: An International Perspective, MICG. Pradhan, R., Mak, A.B, Nair, M., Bennett, S. and Bahmani, S. (2019), “Short-Term and Long-Term Dynamics of Venture Capital and Economic Growth in a Digital Economy: A Study of European Countries”, Technology in Society, Elsevier, In Press. Pradhan, R., Mak, A.B, Nair, M., Hall, P. and Bennett, S. (2019), “The information revolution, innovation diffusion and economic growth: an examination of causal links in European countries,” Quality and Quantity, Spinger, In Press. Pradhan, R.P., Mak, A.B., Nair, M. and Bennet, S. (2019) Inter-linkages between competition and stabilization policies in the banking sector and stock market development in Europe, Applied Economics, Taylor-Francis. In Press. Pradhan, R., Mak, A.B, Nair, M., and Bennett, S. (2019), "Sustainable Economic Growth in the European Union: The Role of ICT, Venture Capital and innovation, Review of Financial Economics, Elsevier. In Press. Pradhan, R., Mak, A.B, Nair, M., Bennett, S. and Hall, J.H. (2018), The Dynamics Between Energy Consumption Patterns, Financial Sector Development and Economic Growth in Financial Action Task Force (FATF) Countries, Energy, 159, 42-53, Elsevier. Pradhan, R., Mak, A.B, Nair, M., Bennett, and S., Bahmani, S. (2018), “Endogenous dynamics between innovation, financial markets, venture capital and economic growth: evidence from Europe Journal of Multinational Financial Management, Volume 45, June, 15-34, Elsevier. Pradhan, R., Arvin, M.B., Nair, M. and. Bennet, S.E. (2017), “Venture capital investment, financial development and economic growth: the case of European single market countries,” Venture Capital, 19:4, 313-333. Pradhan, R.P., Arvin, M., Nair, M., Gupta, A. and Hall, J.H. (2017) Is there a link between economic growth, insurance and the banking sector in G-20 countries, Review of Financial Economics, 13, C, 12-28, Elsevier Publisher. Pradhan, R. P., Arvin, M., Hall, J.H. and Nair, M. (2016), “Innovation, Financial Development and Economic Growth in Eurozone countries”, Applied Economics Letters, 23, 1141-1144, Routledge-Taylor& Francis Group. Pradhan, R.P., Arvin, M., Norman, M.R., Nair, M. and Hall, J.H. (2016), "Insurance Penetration and Economic Growth Nexus: Cross-Country Evidence from ASEAN", Research in International Business and Finance, Volume 36, January, 447-458, Elsevier. Pradhan, R.P, Arvin, M., Neville, Bennett, S., Nair, M, and Hall, J. (2016) "Bond Market Development, Economic Growth and Other Macroeconomic Determinants: Panel VAR Evidence"” Asia Pacific Financial Markets, Issue 2, Springer Publisher. Vaithilingam, S., Nair, M. and Tyagarajan, T. (2015) “Managing money laundering in a digital economy, Journal of Asia-Pacific Business, Taylor & Francis Publishing Group, Volume 16, 1, 44-65. Crosling, G., Nair, M., Vaithilingam, S. (2015), Creative learning ecosystem and innovative capacity: a perspective from higher education, Studies in Higher Education, Taylor & Francis Publishing Group, Volume 40, No.7, 1147-1163. Liew, E, J.Y, Vaithilingam, S. and Nair, M. (2014), “Facebook and socioeconomic value creation in the developing world,” Behaviour & Information Technology, Taylor & Francis Publishing Group, Volume 33, No.4, 345-360. Vaithilingam, S., Nair, M. and Balachander, K.G (2013), “Do trust and security matter for the development of mobile-banking? Evidence from a developing country, Journal of Asia-Pacific Business, Taylor & Francis Publishing Group, Volume 14, No. 1, 4-14. Nair, M. and Vaithilingam, S. (2013), “Leap-frogging the poor to a high income economy: a case study from a developing country,” Journal of Emerging Economies and Islamic Research, UiTM, Malaysia, Volume 1, No. 2, 1-24. Rassiah, P., Nair, M. and Narayanan, R. (2010), “Environmental awareness in the Malaysian hotel industry: an exploratory analysis,” Economic Bulletin, Volume 11, 51-69. Vaithilingam, S., Samudram, M. and Nair, M. (2010), “Trade liberalization, financial deepening and economic growth in a large developing economy: the case of India,” Economic Bulletin, Volume 11, 91-114. Nair, M., Han, G.-S., Lee, H., Goon, P. Lee, P.A., Muda, R. (2009), “Affinity of rural society to the information economy: an exploratory analysis from Malaysia”, Economic Bulletin, Volume 10, December, 101-133. Samudram, M. and Nair, M. and Vaithilingam, S. (2009), “Keynes versus Wagner on Government Expenditures and Economic Development,” Empirical Economics, Springer International Publishing, Volume 36, 697-712. Vaithilingam, S. and Nair, M. (2009), “Mapping global money laundering trends: lessons from the pace-setters,” Research in International Business and Finance, Elsevier Publications, Volume 23, 18-30. Chee Y.L., and Nair, M. (2008),” Macroeconomic management of key sources of economic growth in the Asia-Oceania region: an empirical examination”, Economic Bulletin, 9, December, 41-66. Nair, M., Samudram, M. and Vaithilingam, S. (2008), “Malaysian money demand function revisited: the ARDL approach”, Journal of Asia-Pacific Business, Taylor & Francis Publishing Group, Volume 9, Number 2, 193-209. Zainol, A., Nair, M. and Kasipillai, J. (2008), “R&D reporting practice: case of a developing economy,” Journal of Intellectual Capital, Emerald Group Publishing, Volume 9, No. 1, 122-132. Nair, M. and Chandran, V. (2007), “The short-run and long-run dynamics between manufacturing exports, foreign direct investment and manufacturing output for a developing economy: The Malaysian Case,” Asian-African Journal of Economics and Econometrics, Volume 1, Number 1, 451-458, Serial Publications. Vaithilingam, S. and Nair, M. (2007), “The Factors Affecting the Pervasiveness of Money Laundering: Lessons for Emerging Markets,” Journal of Money Laundering and Control, Emerald Group Publishing, Volume 10, 352-366. Marimuthu, J. and Nair, M. (2007), “Key drivers for employee job satisfaction in conventional and Islamic banks in Malaysia,” Economic Bulletin, 8, December, 113-134. Nair, M., Vengedasalam, D., Madhavan, K. and Govindaraju, C. (2006), “The rise of China’s manufacturing sector: challenges and opportunities for ASEAN-5”, The Philippine Economic Review, UP School of Economics and the Philippine Economic Society, Volume XLIII, June, 167-203. Vaithilingam, S., Nair, M. and Samudram, M. (2006), “Key Drivers for the Soundness of Banks: Lessons for Developing Countries”, Journal of Global Business and Technology, Volume 2, No. 1, Spring, 1-11, Global Business and Technology Association. Khong, K.W. and Nair, M., (2006), The Effects of Customer Service Management on Business Performance in the Malaysian Banking Industry: An Empirical Analysis, Asia Pacific Journal of Marketing and Logistics, Emerald Group Publishing, Volume 18, No.12, 111-128. Salih, A., Nair, M. and Agalawi, T. (2005), “The twin deficit problem in Sri Lanka: An Econometric Analysis, South Asia Journal of Economics, Sage Publications, Vol. 6, No. 2, 221-239. Nair, M. and Kuppusamy, M. (2004), “Trends of convergence and divergence in the information economy: lessons for developing countries,” Electronic Journal of Information Systems in Developing Countries, 18, 2, 1-32. Shanmugam, B., and Nair, M. (2004), Mergers and acquisitions in Malaysian banks’, Managerial Finance, 30, 4, 1-18, Emerald-Insight Publisher. Batchelor, V., Krishnasamy, G., Nair, M. and Shanmugam, B. (2004), Productivity of commercial banks in Malaysia (1990-1999), Jurnul Produktiviti, 20, 91-100, Malaysia. Shanmugam, B., Nair, M. and Ong, W.L. (2003), The endogenous money hypothesis: empirical evidence from Malaysia (1985-2000), Journal of Post Keynesian Economics, Taylor & Francis Publishing Group, 25, 399-611. Shanmugam, B., Nair, M. and Suganthi, R. (2003), Money Laundering in Malaysia, Journal of Money Laundering Control, Emerald Group Publishing, Vol. 6, No. 4, 373-378. Tang, T.C. and Nair, M. (2002), A cointegration analysis of Malaysian import demand function: reassessment from the bounds test, Applied Economic Letters, Taylor & Francis Publishing Group, Volume 9, No. 5, April, 293-296. Nasir, N., Nair, M. and Ahmed, P. (2017), Maqasid al-Shariah and the framework for corporate environmental care in Malaysia, 4th International Conference on CSR, Sustainability, Ethics & Governance, 26-28 July, Perth, Western Australia. Liew, E., Vaithilingam, S. and Nair, M. (2015), “Quality of Regulatory Governance and Affordability on Information Seeking Use and Economic Benefits of Facebook in a Developing Country," 11thInternational Conference on Technology, Knowledge and Society, 23-25 February 2015, University of Berkeley, Berkeley, California, USA. Wong, C. C., Vaithilingam, S. and Nair, M. (2013), “Attitudes of Different Segments of Consumers towards Mobile Advertising”, International Academy of Management and Business (14th IAMB conference, January 21-23, 2013, Texas, USA. Thuraisingam,J., Nair, M., Vaithilingam, S., and Ng, Jason (2012), “Financial Inclusion and Sustainable Development of Marginalised Communities in ASEAN: An Exploratory Analysis”, paper presented at the International Congress on Innovation and Regional Economic Development at the University of Science and Technology of China on the 2nd and 3rd of December 2012. Crosling, G. and Nair. M. (2011), “Developing a creative and innovative learning ecology: lessons for developing countries”, UNESCO-APEID International Conference: Inspiring Education: Creativity and Entrepreneurship, December 2011, Sultan Hotel, Jakarta Indonesia. Crosling, G. and Nair. M. (2011), “A creative and innovative learning ecology: lessons for ASEAN and China”, 1st ASEAN-China Symposium on Regional Integration in Kuala Lumpur, December 2011, Kuala Lumpur, Malaysia. Visvalingam, Singh, M. and Nair, M. (2011), “The influence of selected factors on tacit knowledge sharing behavior in organizations: a conceptual framework,” Proceedings of the 10th International Research Conference on Quality, Innovation & Knowledge Management: Aligning Innovation in Developed and Emerging Economies, February. Wong, C.C., Vaithilingam, S. and Nair, M. (2011), “Adoption of mobile advertising: empirical evidence from a Malaysian survey,” 2011 International Symposium on Technology and Society, IEEE, May 23-25, 2011, Chicago, Illinois, USA. Nair, M., Han, Gil-Soo and Goon, P. (2010), “Trailblazers and laggards in internet sophistication among rural society: empirical evidence from Malaysia,” Proceedings of the 4th International Symposium on Information Technology, Sustaining Informatics and Engineering: Harmonizing Human and Natural Ecosystem, IEEE, 429-438. Vaithilingam, S. and Nair, M. (2006), “Key drivers for soundness of the banking sector: Lessons for Developing Countries”, 2006 GBATA, Global Business and Technology Association; International Conference, Moscow, Russia, June 27–July 1, 2006. Zainol, A. and Nair, M. (2006) “R&D Reporting Practices of Public Listed Companies in Malaysia: A PROBIT Analysis”, 2006 GBATA, Global Business and Technology Association; International Conference, Moscow, Russia, June 27–July 1, 2006. Nair, M., Vengedasalam, D., Madhavan, K. and Govindaraju, C. (2005), “Trade dynamics between China and ASEAN-5: an empirical analysis,” 30th Federation of ASEAN Economic Association Conference – China and India: Challenges and opportunities for ASEAN, Manila, Philippines, 24-25 November, 2005. Nair, M. and Kuppusamy, M. (2005), “Innovation and competitiveness in the information economy: leapfrogging strategies for developing countries”, World Forum on the Information Society, International Research Foundation for Development, Tunis, Tunisia, 14-16 November, 2005. Nair, M., Kuppusamy, M. and Davison, R. (2005), “A longitudinal study on the global digital divide problem: strategies to close cross-country digital gap” The Global Management & Information Technology Research Conference, New York, May 25-28. Nair, M., Madhavan, K, Vengadasalm, D. (2005), “Trade Openness and the Competitiveness of the Malaysian Electronics Sector: An Empirical Analysis”, The 9th International Conference on Global Business and Economics on Management Challenges in Times of Global Change, Seoul, South Korea, May 25-28. Salman, A.S. and Nair, M. (2005), “The twin deficit phenomena in Philippines: an empirical examination”, Singapore Economic Review Conference, Singapore, September 4-6. Nair, M., Davison, R., and Kuppusamy, M. (2004) , “Competitiveness of ‘ASEAN-5’ in the information economy: an empirical analysis”,13th Annual Asia Media Information & Communication Centre (AMIC) Conference on ICT Media Inputs & Development Outcomes: Impact of New and Old Media Development in Asia, July 1-3. Nair, M., Davison, R. and Kuppusamy, M. (2004), “ASEAN and the knowledge economy”, 29th Conference of the Federation of ASEAN Economic Associations (FAEA) on ASEAN Economic Cooperation: New Dynamics, and New Paradigms, December 10-11, 2004, Kuala Lumpur, Malaysia. (Conference Key Note Address). Nair, M., Deviga, M. and Madhavan, K. (2004), “Impact of trade openness and the competitiveness of the Malaysian Electronics and Electrical Sector”, 19th Malaysian Economics Association Convention, 9 December, Kuala Lumpur, Malaysia. Shantha, V. and Nair, M. (2004), “Private sector financing on economic growth in Malaysia: results from the bounds test,” 2004 International Economics & Business Research Conference, Miami, USA, December15-18. Nair, M. and Kuppusamy, M. (2003), Leapfrogging in the new economy: lessons for developing countries, The 15th Convention of the Malaysian Economics Association on ‘The Malaysian Economy at Crossroads: Challenges and Opportunities’, July 22-23, Kuala Lumpur, Malaysia. Mohamad, S. and Nair, M. (2003), Exchange rate policy in selected ASEAN countries: were currencies deliberately undervalued to promote export performance? The 15th Convention of the Malaysian Economics Association on ‘the Malaysian Economy at Crossroads: Challenges and Opportunities’, July 22-23, Kuala Lumpur, Malaysia. Mohamad, S. and Nair, M. (2003), Were the currencies deliberately undervalued? An empirical examination of exchange rate performance in selected ASEAN economies, International Conference on Asia Pacific Business Environment: Innovative Responses to Regional Events, January 21-22, 2003, Shah Alam, Malaysia. Shanmugam, B. and Nair, M. (2002), Rise of Islamic Banking: Problems and Prospects, Siena 2002 Wolpertinger Banking and Finance Conference, September 11-14, Siena, Italy. Nair, M., Davison, R. and Shanmugam, B. (2002), Modelling the Malaysian cocoa response supply function: a robust cointegration approach, Asia Pacific Economics and Business Conference, October 2-4, @ Kuching, Sarawak, Malaysia. Alias,M., Nair, M. and Tang, T.C. (2002), A robust estimation of cointegrating relationship between palm oil and soybean prices: results from the bounds test, Asia Pacific Economics and Business Conference, October 2-4, @ Kuching, Sarawak, Malaysia. Mohamad, S. and Nair, M. (2002), ‘Exchange rates and export competitiveness in Selected ASEAN Economies’, 8th International Convention of the East Asian Economic Association, October 26-29, 2002, Kuala Lumpur, Malaysia. Nair, M. and Smith, B. (2001), Recent developments in statistical cluster analysis, Proceedings on International Conference on Recent Developments in Statistics and Its Applications, Institute of Statistics Malaysia under the auspices of the East Asian Pacific Regional Committee (EARPC) of the Bernoulli Society and The Institute of Mathematical Statistics, June, pp. 23-34. The Service Above Self Award in recognition of contribution to the Business Community in the district of Klang, Malaysia. Member on the Working Group, Increasing Broadband and Quality for National Transformation Position Paper, Academy of Sciences Malaysia, 2012-2013. Expert Panel Member, National Fundamental Research Grant Scheme (FRGS), Ministry of Higher Education, Malaysia, February 2012. Panel Member, Unit on the Formulation of the National Innovation Policy, UNIK-Prime Minister’s Office, Malaysia, November 2010 to June 2011. Member, National Economic Action Committee (NEAC-Prime Minister’s Department) Working Group on SRI-6 Knowledge Infrastructure – Malaysia’s New Economic Model , May 2010 – December 2010. Technical Committee Member, 2010 Information Technology Symposium, jointly organized by University Kebangsaaan Malaysia and University Petronas Malaysia, Kuala Lumpur, 15-17 June 2010. Moderator, 2010 Professional Examinations of the Chartered Tax Institute of Malaysia for the Economics and Business Statistics Examinations. Adjunct Professorship, School of Public Affairs, University Science and Technology of China, March 2011. “Malaysian budget 2014 – Paving the way for the 11th Malaysia Plan,” StarBiz TV, 13 October, 2014.